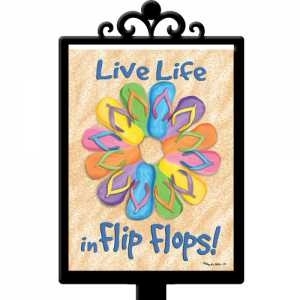 Bright flip flops assorted colors on the beach with text "Live life in flip-flops"! A magnetic Yard Designable by Custom Decor. Designables are vinyl and magnetic. They can be used with the Metal Yard Stake cd8401 by Custom Decor from flagsrus. Made in the USA. Approximately 8" wide x 11" tall.